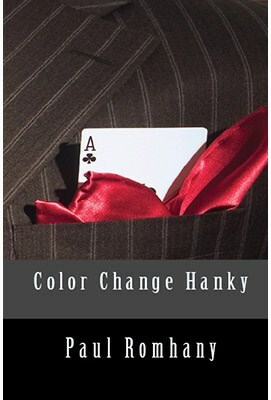 The Color Change Hanky is the perfect opening routine as it can set up the performer's personality, and show they have incredible skill. In this 74 page book Paul Romhany shares several hilarious professional scripts that take this classic effect to new levels, and includes some original twists that will unexpected by your audience. Professional Comedy Writer and Magician Hal Spear shares some of his professional routines that are perfect for comedy clubs, cruise ships and stand-up performances. There is a chapter with step-by-step photographs showing Paul's handling for his own routine that has been a staple of his comedy act for the past twenty years. It also includes a unique handling by Wayne Rogers that does away with having to use two dye-tubes to do the surprise half-and-half McComb finish. Bruce Johnson contributes a chapter on how to color your own silks, and add words and pictures - opening up some great ideas and routines for trade-shows, school shows and themed shows. The book also covers the various dye-tubes on the market, and some insight in to preparing your silks to make your own unique routine. The ultimate book for anybody who wants to do, or already performs and is looking for something fresh and different for a Color Change Hanky Routine.